Currently has a .8 meter Ritchy Chrietien telescope employed full time searching for exoplanets using the transit method. A 1.1 meter Dahl Kirkam telescope is under construction in southern Arizona. The larger telescope will use the radial velocity method to detect exoplanets using star wobble. Status: Ongoing, funded. 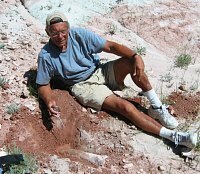 We have tracked down the original dig site of the very first Tyrannosaur specimen. Only 14% of the skeleton was recovered 100 years ago so more could be in the ground. Looking for investors to fund a museum to acquire the site from the landowner. Status: Ongoing, not funded. Working with the FBI our Cooper Research Team was allowed exclusive access to the original evidence and records. Many aspects of the crime were investigated and particles from D.B. Coopers tie were analyzed for the first time. The results of that research can be seen here CitizenSleuths.com Status: Concluded.